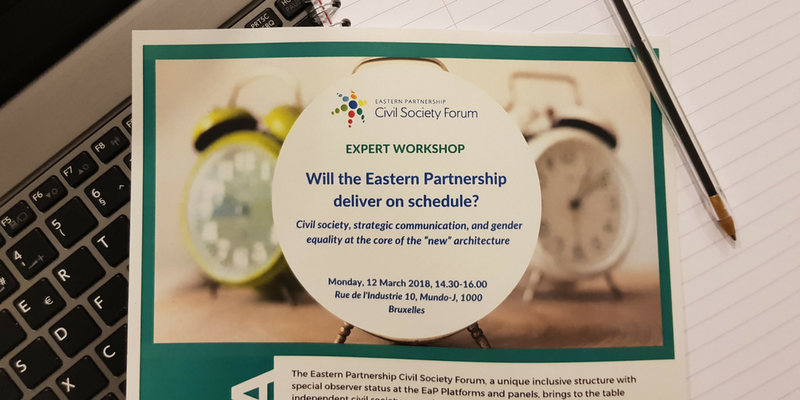 On 12 March, the Eastern Partnership Civil Society Forum (EaP CSF) took part in the formal launch of the renewed Eastern Partnership architecture attended by high-level officials from the EaP countries and the EU. 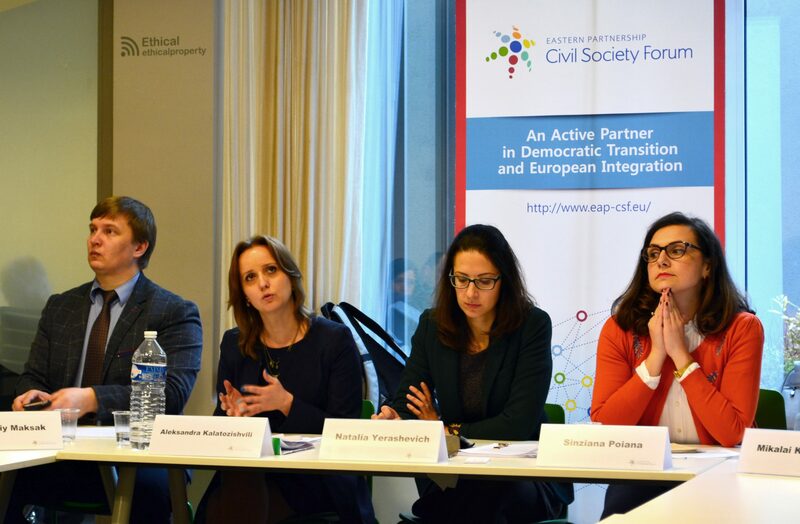 Being a major civil society stakeholder, the Forum plays a constructive role in the framework of the Eastern Partnership along with the EU, partner governments and the EU member states. At the event the Civil Society Forum was represented by six EaP CSF Steering Committee members from the EaP countries, two of whom addressed the participants of the launch event and the Senior Official Meeting conveying the position of the Steering Committee on the EaP achievements and challenges. 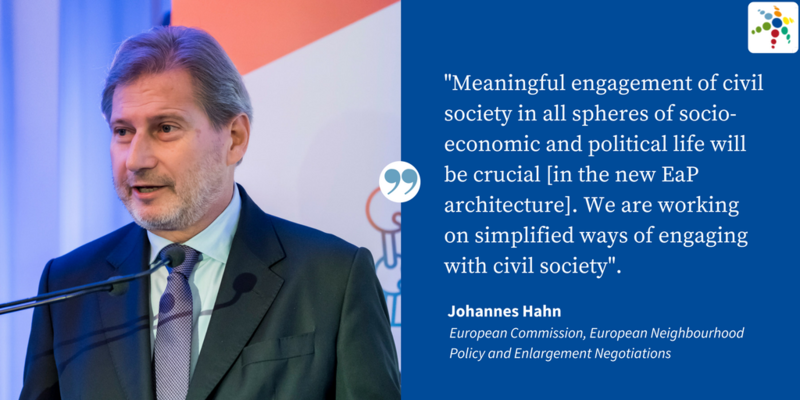 Commissioner Johannes Hahn opened the event stressing that the meaningful engagement of civil society in all spheres of socio-economic and political life is crucial and that the EU is working on simplified ways of engaging with civil society. 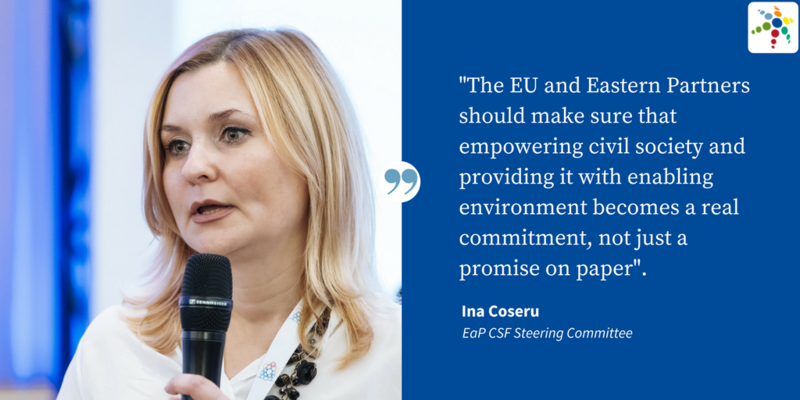 Ina Coseru, the EaP CSF Steering Committee member, speaking at the panel on ownership, inclusiveness and differentiation, shared the CSF vision on the “20 Deliverables for 2020”, and the civil society expectations from the EU and EaP governments The importance of civil society was endorsed by all the officials in their interventions or during the Q&A sessions. The Steering Committee member reiterated that diplomatic efforts should be matched by a comparable and compatible support to civil society, still struggling to be accepted by EaP governments as an equal partner. Ms Coseru underscored the pressing need for a stronger commitment to streamlining human rights, including at the level of the platforms and panels. The Forum’s strives to ensure that the permanent observer status at the meetings corresponds to a real possibility to have a substantial impact on the implementation of the commitments in the EaP countries. In that sense, Ms Coseru underlined the importance of further supporting trilateral dialogues to secure the genuine access of the civil society to decision-making. “The EU and Eastern Partnership should make sure that empowering civil society and providing it with enabling environment becomes a real commitment, not just a promise on paper”. 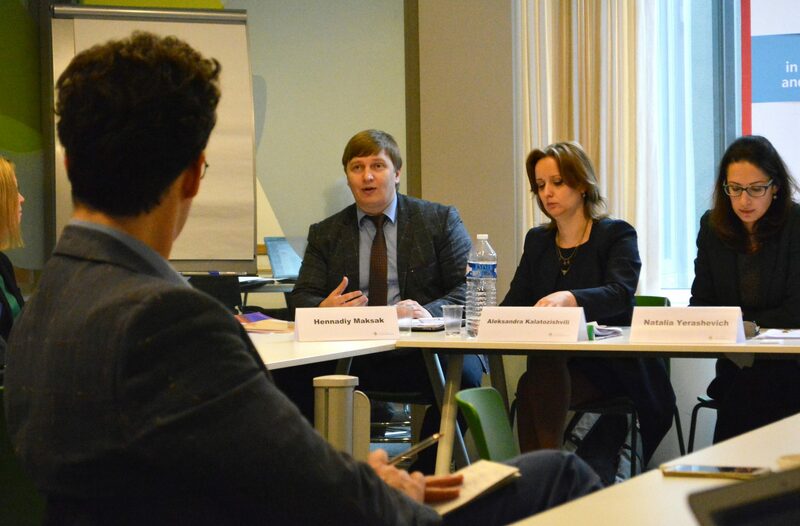 The Forum members raised several urgent issues with the EaP governments’ representatives. The Ukrainian Deputy Minister of Foreign Affairs for the European Integration was asked to comment on the case of Fikret Huseynli, a Dutch journalist of Azerbaijani origin currently in hiding in Kiev after having been threatened with the extradition to Azerbaijan where he could be prosecuted under fabricated charges. 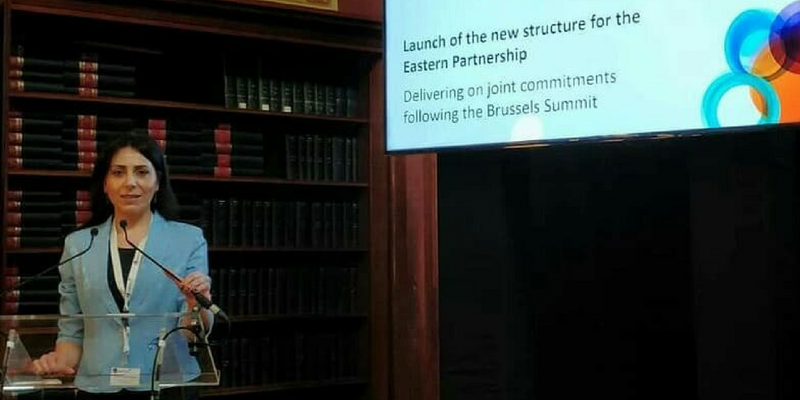 Invited to address the Eastern Partnership Senior Officials Meeting (SOM) for the first time, the EaP CSF emphasised the central role and commitment of the civil society to hold governments accountable in contributing to democratic governance by supporting human rights. 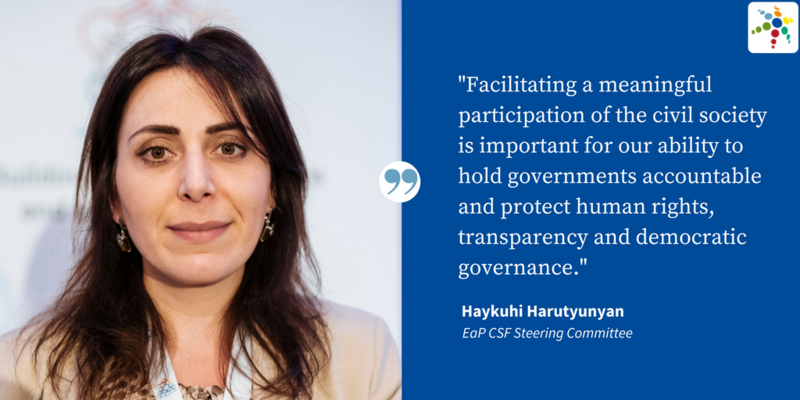 Steering Committee member Haykuhi Harutyunyan defended civil society’s place as an equal partner in designing, implementing and monitoring the policy in the framework of the 2020 Deliverables. In her address, Ms Harutyunyan also raised concerns over the main challenges faced by civil society in the EaP countries, such as an effective involvement of Armenia’s civil society in the CEPA (Comprehensive and Enhanced Partnership Agreement) implementation; the continuous persecution of critics by Azerbaijani authorities; the lack of specific indicators for measuring progress on the EU-Belarus bilateral agenda; persisting issues with independence of judiciary in Georgia; Moldova’s government attempts to pass laws restricting CSOs activities; and the long-awaited establishment of the Anti-Corruption Court in Ukraine. 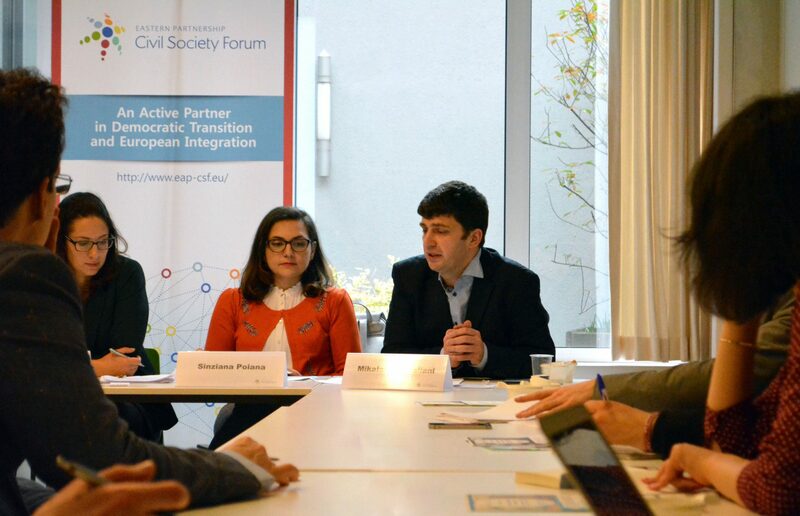 As a follow-up and reflection on the official EU launch, the EaP CSF held an Expert Workshop on the three 2020 crosscutting deliverables – civil society, strategic communication, and gender equality. 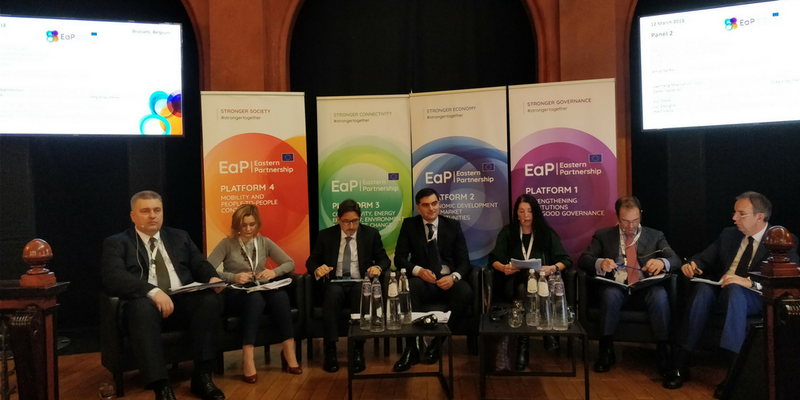 The event attended by officials from the EaP and EU Member States, representatives of the EU institutions, think tanks and CSOs highlighted the independent civil society expertise and views on the 2020 agenda. 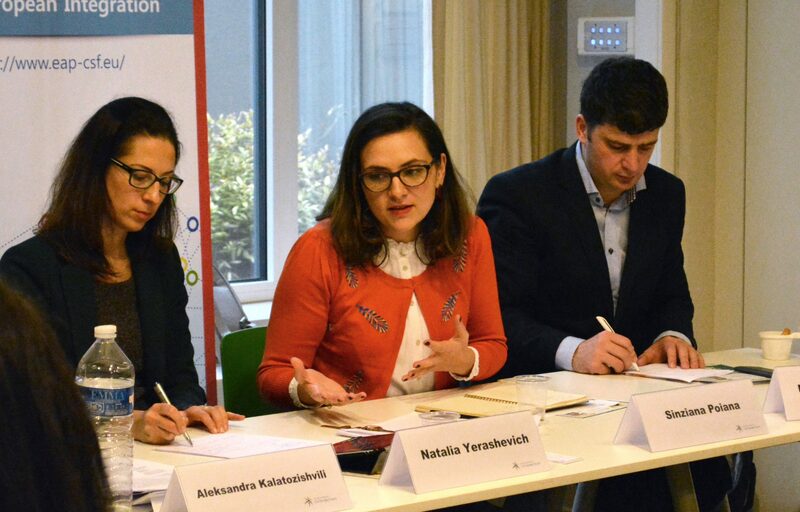 Aleksandra Kalatozishvili, Steering Committee Co-chair, stressed the importance of investing in capacity building of the civil society sector and addressed the intention of the CSF National Platforms to bring their strategies and action plans in accordance with 2020 Deliverables. Mikalai Kvantaliani presented the challenges and progress in the field of gender mainstreaming, including the gender audit guidelines produced under the re-granting scheme of the EaP CSF allowing the National Platforms to streamline gender sensitive issues in their work. He also mentioned the need for further commitments on human rights in the 2020 Deliverables, including press freedom, particularly in light of the recent developments with attacks against journalists both in the EaP and in EU countries. Hennadiy Maksak, addressed the challenges the reviewed EaP structure is still facing, including the need for improving the trilateral formats and extending the EaP CSF role in the official meetings from a permanent observer limited to a short intervention to a full-fledged and equal participant of high-level discussions. He also underlined the threats of disinformation the EaP countries are facing and the CSF contribution to finding solutions through implementing targeted monitoring projects. DG NEAR Policy Officer Sinziana Poiana reiterated the EU’s unwavering commitment to support civil society in the Eastern Partnership and plans to further enhance the role of the EaP CSF already holding a unique place in the new architecture. She pointed out the linkage between the results of monitoring the civil society environment listed in 2020 Deliverables, political dialogue and funding decisions. 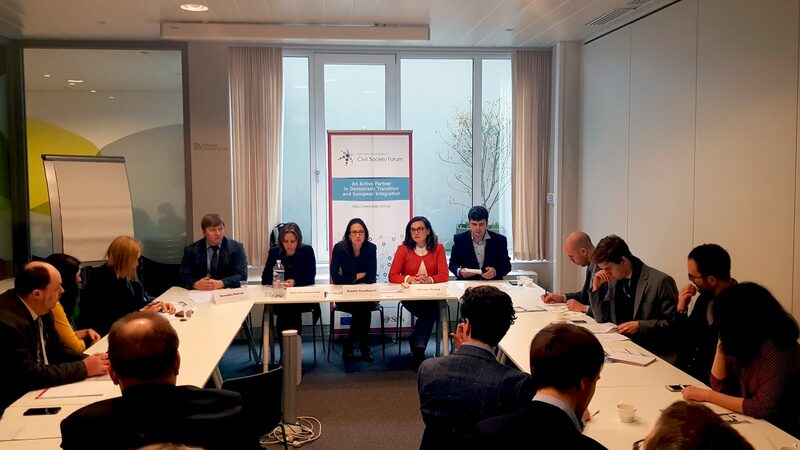 The experts discussed the EU support to the civil society in the particularly challenging environments of Azerbaijan and Belarus, revision of EU external financing instruments, joint efforts on fighting Russian propaganda, and building trust between the civil society and the governments.